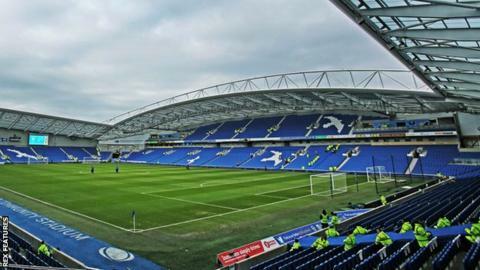 Championship leaders Brighton & Hove Albion have announced a financial loss of £10.44m in their accounts for the year to July 2015. The Sussex club's net loss the previous campaign was £10.6m. Brighton saw a slight fall in turnover to £23.7m but operational costs were reduced to £11.8m. "Any Championship club wishing to compete for promotion will inevitably make significant losses," Albion chairman Tony Bloom said. "It remains a delicate balancing act for the board, recruitment team and manager as we strive to achieve our ultimate aim." Under Financial Fair Play Rules agreed in November 2014, as from the 2016-17 season Championship clubs will be permitted to make an aggregate loss of £39m over a three-season period. "We reluctantly supported these changes as it does provide us with greater flexibility and the option to compete with those clubs benefitting from parachute payments from the Premier League," Bloom added. "We still firmly believe in the principles behind the FFP rules and I believe prudent investment remains the correct way to build our football club. "Our ambition remains for the club's teams, both men and women, to play at the highest level possible - and as chairman I will do everything I possibly can to achieve that and I remain fully committed to that goal." Brighton, who finished 20th in the second tier last season, are currently two points clear at the top of the Championship and are still unbeaten after 18 league games. "We have had a very good start to the season but we all know just how competitive the Championship is, so it's important we do not become complacent," Bloom said. "There is still a lot to do to realise our ambition of playing at the highest level."